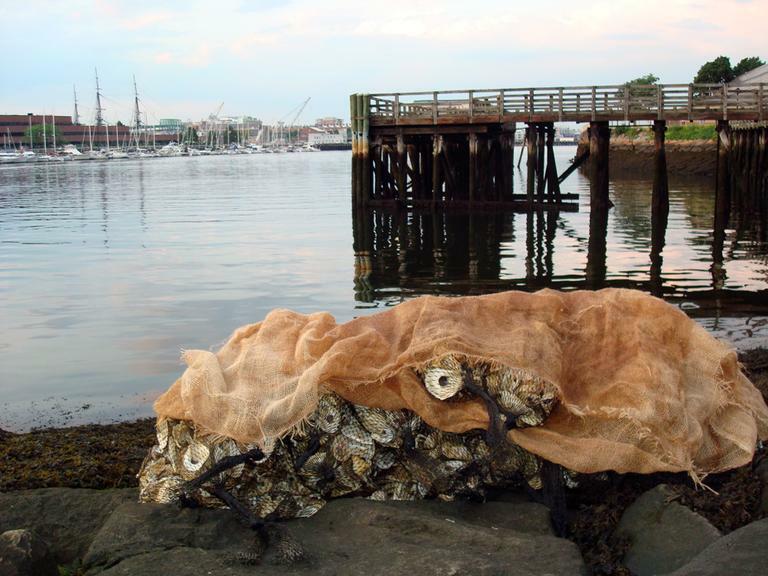 Oysters were once plentiful in the waters around Boston. They served as an important food source for Native Americans and colonial settlers alike. By the early 20th century, over-harvesting, industrialization and landfill had taken their toll, and the oysters vanished. But today, along the murky bottom, a fledgling brood of bivalves is back, thanks to the efforts of the Massachusetts Oysters Project. And these oysters aren't for eating; they have a higher purpose. In 2006, author and part-time Gloucester resident Mark Kurlansky published a book called "The Big Oyster," about the huge oyster beds that used to line the Hudson River estuary and fed all of New York City. In Boston, the book wound up in the hands of a dentist-turned-fund-manager named Andrew Jay. "A whole series of people in my neighborhood in Charlestown had read it, and someone said, 'I wonder if there were ever oysters in Boston Harbor,'" Jay recalls. "And someone else said, 'wouldn't it be neat if we brought them back?'" 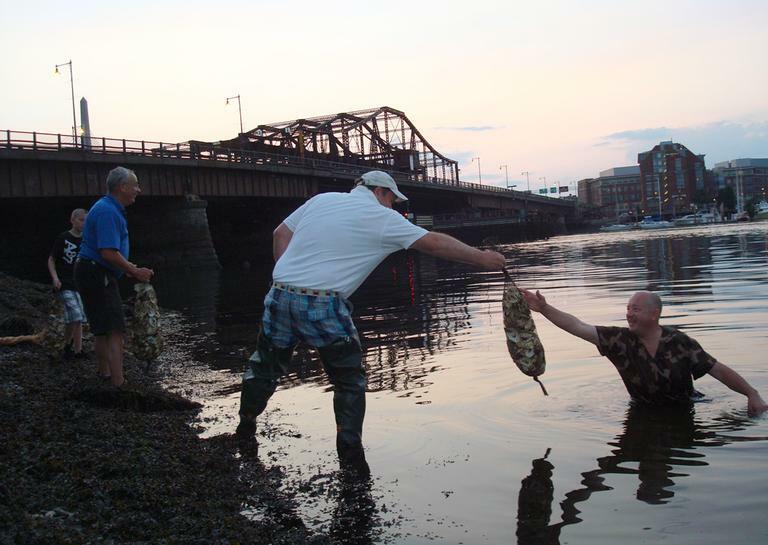 Thus the Massachusetts Oyster Project was born in 2008, an all-volunteer effort aimed at bringing oysters back to the harbor; not for slurping, but for scrubbing. "Each oyster can filter 30 gallons of water a day," Jay explains. "They pull out silt, phytoplankton, and bacteria." Phytoplankton are what make up the red tides, fed by the nitrogen that results from us feeding ourselves. "Nitrogen is contained in urine. The average person in the Boston area is contributing 12 pounds of nitrogen into Boston Harbor, so one of the good things about oysters is they fix that nitrogen into their shells. They're about 8 percent nitrogen by weight." Sewage runoff isn't nearly the problem it once was in the harbor, thanks to the Deer Island treatment plant, completed in 1998. And now, the opening last month of a huge new sewage tank along South Bay promises to makes beach closures an annual, or bi-annual rarity. But Jay thinks oysters could solve the problem the rest of the way. "If you have a heavy rain, you're still gonna have surface runoff go into the harbor. But think about it, if you have a population of oysters there waiting to clean it, if the beach is closed down for five days, maybe we can reduce that beach closing to one day, or two days. Or we [could] have the baseline level of pollution so low that when we do get some effluent coming in, it doesn't make as big an impact." At the edge of the North End where Commercial Street turns onto the Charlestown Bridge, Jay has backed his car up to the waterfront. A couple of his volunteers go about unloading heavy, netted bags of shells from the trunk. "These oysters' shells were actually salvaged from an event at B & G oysters, their oyster invitational." Jay actually sent volunteers to the posh South End eatery to rescue shells right off of bus boy's trays. They make an ideal home for oyster spat, that is, baby oysters, which have been seeded onto the surface of these shells. Jay and his volunteers wade into murkey water just off shore and gently lower the bags. A gaggle of crabs and starfish encroach, smelling dinner. Hopefully, the spat on the interior of the bag will be out of their reach, but it's not just predators that have been attracted by all the commotion. A sinister boat draws near. "Uh, this is probably the State Police or the Harbor Police coming in to ask what we're doing," Jay grumbles. Apparently the fuzz gets a little twitchy when they see men wading in the harbor, particularly around the bridges. "Hey boss, what are you up to," a stern-looking female officer wants to know. "We're not taking anything out," Jay replies respectfully. "We're just putting down some spat on shell." Jay promises to call and warn the police next time his group comes out here. The Oyster Project has enjoyed a good deal of support from the various entities with jurisdiction in Boston Harbor, but this isn't the first time authorities have gotten a little jittery. "The Division of Marine Fisheries in some ways has been super, in that they've allowed this program to go on," Jay says. "On the other hand, they are concerned about creating a tempting hazard." The waters off Boston Harbor are closed to shell fishing. If Jay's organization does succeed in establishing oyster reefs, they run the risk of those oysters being harvested illegally, and getting into the food chain. Jay says he'd love to plant some oysters in other spots, like Fort Point Channel, but the state won't let him. He's had to turn down more than 50-thousand dollars in grant offers because, unless he can expand, there's simply nothing to spend it on. But he does share the concern about people eating these oysters, which are filled with all kinds of pollutants. That's why Jay and his volunteers are trying to position these bags such that they're not noticeable from shore. 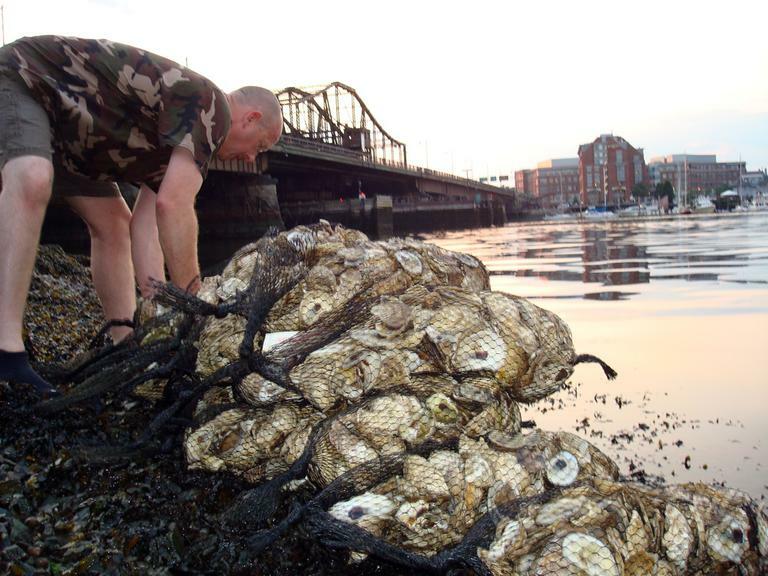 Over the last three years, the Massachusetts Oyster Project has proven that oysters can survive in Boston Harbor. What Jay is hoping to prove this summer is that these nascent reefs can be self-sustaining. "We have some oysters now that have been down for a couple years," Jay says proudly. "They are of the requisite size that they should be able to reproduce, and we're hoping we'll see some signs of young oysters popping up." I ask Jay if we'll ever be able to eat these oysters. 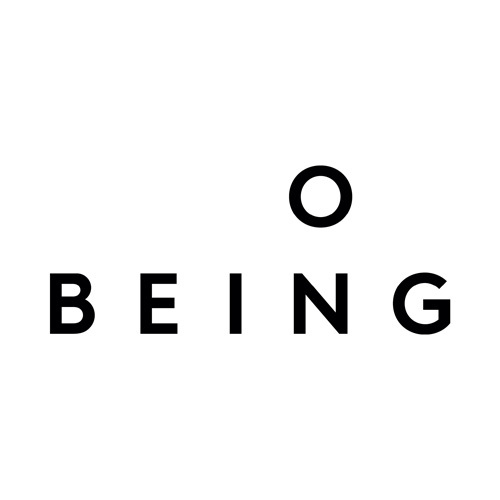 "Probably not in your or my lifetimes," he replies. "But maybe, maybe in our children's lifetimes." As Jay and his guys finish up, even more crabs move in. To look at it, you'd never know the harbor contained so much life, but thanks to clean-up efforts, what was known in the 80s as "the filthiest harbor in the nation" is now incredibly vital. Mackerel have been spotted, and even scallops, stripers, and lobsters. If successful, Andrew Jay's oyster reefs could represent the crowning achievement; a biological homecoming that both seals and signifies the revival of Boston Harbor. This segment aired on July 15, 2011.